At this point you've likely either seen the litter problem yourself, or perhaps you feel the itch to take action based on what we've shown you so far. We want to connect with new and veteran litter pickers to form the Bucket Brigade. This will be the AWAY Project's army of foot soldiers on the ground taking on litter piece-by-piece. Anyone is welcome to join the Bucket Brigade, especially anyone who is still skeptical about whether litter is really a problem. Once you start looking around the problem should become pretty evident. Joining the Brigade is easy to do, it doesn't require investments or detailed training, and it will begin to yield real results immediately. Let's connect and take on this problem together! Who is the bucket brigade? The Bucket Brigade is a group of volunteers taking on the problems of litter and illegal dumping piece-by-piece. It is quickly becoming a major eyesore in a lot of places, and that doesn't even considering the potential environmental impacts of each piece. Since many of these single-use products won't biodegrade for dozens to hundreds of years (possibly thousands by some estimates), it's not just going to go away on it's own. Worse yet, its actually accumulating while plastic production increases! It's going to take a lot of people-power to take on the vast amount of litter I'm seeing accumulating out there. We would encourage everyone who follows the AWAY Project to grab a bucket and take action at your favorite places! The Bucket Brigade is both a personal commitment AND a social support network. Hopefully, many of us can connect at group cleanup events and pick up trash together. The internet will provide a means for use to connect with other concerned citizens around the world! Like litter, the AWAY Project is being built to last. We're just getting started on a vision we're committed to for years to come. We have no expectations of fixing the litter problem overnight, and because this is a genuine grass-roots movement we're not just going to give up when the going gets rough. We're in this with you for the long haul! Looking to the future we're already hunting down sources of used buckets that can be salvaged and repurposed to keep them out of landfills. I've personally witnessed hundreds and hundreds of 5-gallon buckets being thrown directly into the trash after JUST ONE USE! We're hoping that over time we will be able to set up a means of distributing these salvaged buckets to folks interested in joining the bucket brigade. As well as distributing them to Brigade members interested in starting a local chapter and organizing their own local group cleanup campaigns. Step 1: Save a bucket! "I've personally witnessed hundreds and hundreds of 5-gallon buckets being thrown directly into the trash after JUST ONE USE!" There are a few good reasons for choosing buckets as our primary action tool. First and foremost, as a symbol. In some parts of the world, a 5-galloon bucket is considered so valuable it would be offensive to drill a hole in the bottom. Yet here in the United States they can be found everywhere. I see them on the side of the road constantly! On top of that, many industries regard them as a single-use item. For instance, in Pennsylvania, a restaurant can't re-use a pickle bucket to store other food if it's clearly marked as a pickle bucket. Crazy right? Our hope is to salvage and re-purpose as many as we can! There are many industries which regularly send these buckets to the landfill. Call around to some local businesses and ask if they can hold on to a bucket for you. You can also find them regularly being given away for free on Craigslist. In addition to being a symbol, the buckets offer us a reusable container that helps avoid using plastic bags which take unknown numbers of years to biodegrade in landfills. If you're able to get a bucket with a lid they're also typically watertight. That's really handy when you want a small container to put in your trunk that will contain any smell or small amounts of contaminated liquids that might be in the litter and ultimately your bucket. so try to find buckets with lids. Buckets also act as a conversation starter. If people start popping up on trails and in popular destinations carrying these buckets people are going to wonder what's going on. Take a moment to tell people about what you're doing and raise awareness about litter. "Once you start noticing the litter it's hard to stop, and it feels pretty good every time you fill that bucket." You've got your bucket, now it's time to get to work! Make a personal commitment to get out and fill your bucket at least once a week. The bucket will seem big at first, but it typically doesn't take long to fill it up. There are many sites I've recently visited that only took 5-10 minutes of simply walking around the parking lot to fill the bucket to the top. The only other tools you may need is a good pair of gloves (we recommend a pair of water-resistant leather work gloves so they can be reused and offer a bit more protection than latex gloves), and a grabber if you want to save your back from the stress of bending over constantly. If you're planning on picking up near traffic high-visibility vests and/or clothing would be highly recommended. Safety first! How much and how often you pick up is totally up to you. I would recommend starting with a simple goal of going out once a week. Once you start noticing the litter it's hard to stop, and it feels pretty good every time you fill that bucket. So once you get into the habit of a weekly walk you may find yourself wanting to step it up to twice a week or more. Before long you might start attending group walks in your area, or maybe even begin coordinating a local bucket brigade of your own! "strive to reclaim whatever raw materials we can"
Once you get home with your bucket it's time to sort out the recyclables from the refuse. 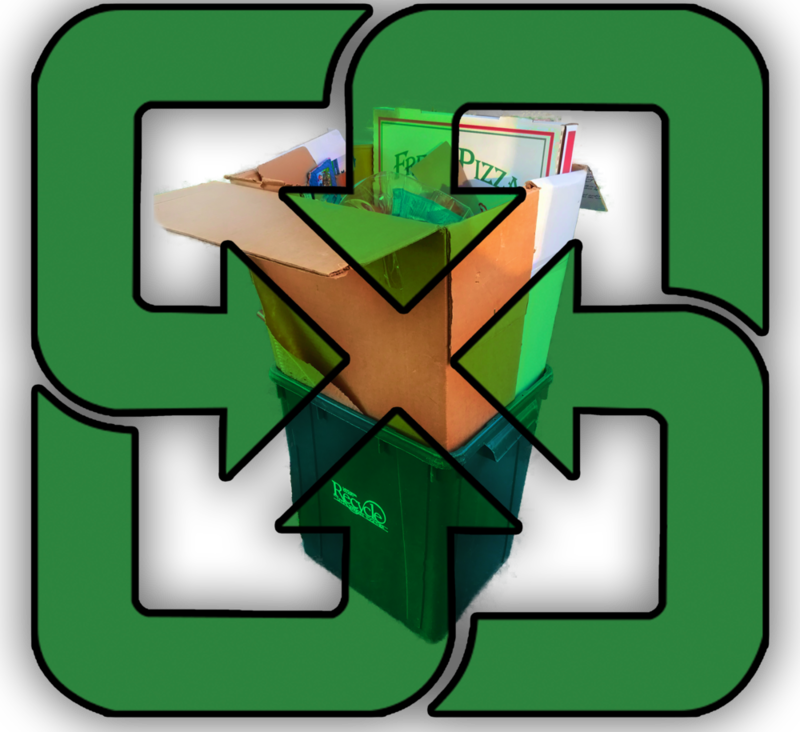 You should know that much of what you'll collect is not considered recyclable. Yes, unfortunately, recycling doesn't quite meet the imagery many of us have in our heads, but we should still strive to reclaim whatever raw materials we can. Metals and glass are highly recyclable, but there's a lot of grey areas about which plastics are recyclable. This is a topic I will be covering in more depth later, but for now be sure to check with your local municipality or trash removal provider to find out whats recyclable in your area. If you have room at your home, or place of business, to store collected items there are a variety of options you can find online for recycling things your municipality just won't except. For some really hard to recycle items such as chip bags, cigarette butts, foil packets, etc. I would recommend checking out terracycle.org. They have a very interesting approach to recycling! The AWAY Project is intended to be a combination of personal commitment and collective action. If you want to take the lone wolf approach that's cool! If you want to organize some friends in your area that's awesome as well! Whenever you're ready we would love for you to checkout some of the links below and share your journey with us. Another big part of our mission is raising awareness about this issue, we hope that collectively we can remove the litter and raise the level of consciousness about what's littering our backyards.